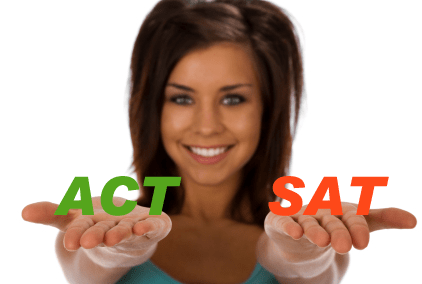 Which is right for you, the ACT or SAT? This is a question that is extremely important if you are a high school student who is beginning the college application process, and you are trying to determine which test is more appropriate for you. If you have not yet experienced either test, you might think that aside from the obvious differences (such as the science section on the ACT that is absent from the SAT), that the two tests are essentially the same. After all, reading is reading and math is math, right? Not so.In actuality, the ACT and the SAT are significantly different. The ACT is a content-based test, measuring what students have learned in school, while the SAT is more of an aptitude test that focuses on critical thinking and reasoning. 1) The ACT contains a science reasoning section, and the SAT does not. However, the ACT does not require extensive scientific knowledge retained from the classroom. The test consists of seven passages focusing biology, chemistry, earth/space sciences and physics, and asks students to evaluate the information using the paragraphs, charts, tables and diagrams that are provided. If your school has a strong science program, you will do fine with the ACT science reasoning material. Your only challenge then will be getting through all the science passages within the time limit –which is one of the design parameters of most standardized exams. 2) The SAT has a stronger emphasis on vocabulary, and includes reading comprehension questions for which there can be several correct answers. A student’s task is to select the “best” correct answer. As hard as some students try, they can never develop a kind of feel for which is the best correct answer. This can be even more challenging for international students. As a result of this, many students prefer the ACT simply because they feel that the test is more straightforward. 3) The ACT tests more advanced math concepts. The math on the SAT involves much more critical reasoning and requires less knowledge of rules and facts. Here is an example: On the SAT, you might be given a rectangular coordinate system with five lines on it, four of which are tilted upward at different rates from left to right, and one which tilts downward at a much steeper rate than the others. You might then be asked to select the line with the greatest slope. The line that slopes downward from left to right is the steepest, but the slope is negative and therefor the smallest. The answer choice “the steepest line has the smallest slope” is incorrect, and yet a great many students will select it. The ACT, however, might give students two ordered pairs, (2,3) and (-1,6) and ask them to calculate the slope of a line passing through both the points. 4) The SAT has a guessing penalty, whereas the ACT does not. The sole purpose of the ACT is not to find out what you know, but instead it is to find out how much you know and how you can perform relative to your peers taking the same test. Since no one is penalized for guessing, and you are competing against everyone else, there is no advantage to guessing and only a disadvantage if you forget to bubble in random answers for all the questions you don’t know. In California, the ACT is gaining popularity, although the SAT is still the dominant exam. One of the main reasons for this is that the University of California schools were the very first client of the College Board (the guys who create and administer the SAT), and to this day the University of California schools remain the biggest client. In the Midwest on the other hand, the ACT is by far the dominant test. However, overall there are now more students taking the ACT than taking the SAT in the United States. Here at Hunter Programs, we can help students assess which test is better suited to their strengths, and work with them to ensure that they achieve the best scores possible. New York Times to further help you decide which test is best for you. Washington Post for an incredibly interesting perspective on these two tests. ACT for a sheet of interesting ACT facts directly from the creators of the ACT. CollegeBoard for important SAT facts directly from the writers of the SAT.